Oahu is known as the meetingplace of east and west. It is also known as the capital of Hawaii, mostly it is a combination of Hong Kong meets Los Angeles. It dominates the cultural, economic, and political life of the islands. Oahu is not only a military stronghold, but also a popular tourist spot. 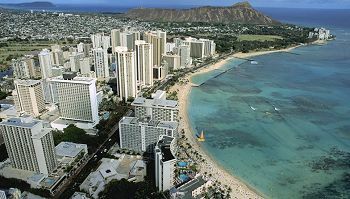 Oahu has one of the world's most famous beaches, and some excellent resorts as well. Ilikai Hotel Here you will find a lagoon covered by palm trees. Atlantis Submarine 973-9811 With the ability to carry 48 passengers, this submarine takes you under the sea for a close-up look at an artificial reef. Queen's Surf This is a picnic area that is decorated with different types of people. On weekends one can find conga drummers along the beach. Merchant Street This is the center of the old downtown area of Honolulu. Koko Crater Botanical Gardens 522-7060 This garden is 200 acres complete with a collection of cacti, plumeria, and other Hawaiian plants. Haleiwa Surf Center 637-5051 This center teaches watersports such as surfing, sailing, snorkeling, swimming, life saving, and more! Aloha Dive Shop 395-5922 This shop has courses and adventures for certified divers. Hawaii Sea Adventures 487-7515 This company features lessons as well as full day and half day excursions and charters. Kono Sports Fishing 536-7472 You can fish the Leeward Coast and the waters off Molokai. Wahiawa Public Fishing Area A great place to catch Chinese catfish. The Beachside Cafe 922-3111 This restaurant offers indoor and patio dining. Michel's 923-6552 A white tablecloth French restaurant. Fisherman's Wharf 538-3808 This a classic fisherman's restaurant decorated with nautical gear. Yong Sing Restaurant Try their oyster sauce chicken. Liliha Seafood Restaurant 536-2663 This restaurant comes highly recommended by local folks. Maile Restaurant 734-2211 This is one of Oahu's finestest dining rooms. Hanatei Bistro 396-0777 This restaurante showcases the French and Japanese cuisine of one of Hawaii's top chefs. Come and experience the diversity of an island paradise where cosmopolitan conveniences are surrounded by breathtaking scenery. Envelop yourself in the Aloha Spirit - a way of life in the islands that will leave you longing to return to Oahu, the heart of Hawaii. "Hang loose" at the world-famous Waikiki Beach or find your own secluded stretch of sand. A short drive out of town in any direction will bring you face to face with uncrowded beaches, natural wonders and beautiful scenery. The island of Oahu welcomes you to paradise found.